Why Leave Grass Clippings on the Lawn? Lawn turfgrasses provide many benefits to our immediate environment. Soil erosion control, improved protection of groundwater, improvement of the quality of life through noise and dust abatement, improvements of air quality, and aesthetic and recreational contributions are some of the assets provided by turfgrasses. However, disposal of grass clippings is an ongoing issue that requires the attention of homeowners in order to be a good land steward! 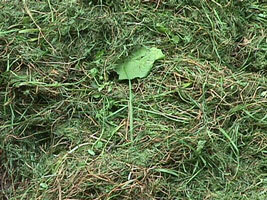 Grass clippings traditionally have been bagged and hauled to landfills or yard waste processing centers. The Environmental Protection Agency [EPA] estimates that yardwaste accounts for 18% of the refuse that we historically have dumped into landfills, a figure that rises as high as 50% during the growing season. Typical yardwaste is composed of approximately 25% tree leaves and limbs, and 75% grass clippings. In recent years, dumping of grass clippings has become a problem because landfills are running out of space. One third of all municipal landfills are expected to soon reach capacity, and new sites are difficult and expensive to establish. The most unappreciated problem with off-site clipping disposal is that potentially valuable commodities, plant organic matter and the nutrients derived from it, are being discarded as a waste material! When clippings are continually removed from a lawn, natural nutrient cycling is partially reduced. An environmentally sound option is the direct return of fresh clippings to the lawn. This technique is known as Grasscycling. Variations of this theme include the use of Fresh Grass Clippings [FGC] on other locations, and Grass Composting. The use of any or all of these methods effectively eliminates the need to haul grass clippings to a landfill. * Bagging may be the accepted practice in the neighborhood. * Clippings can become unsightly when they lay on top of the turf canopy. * Turf can be smothered due to the inconsistent clipping dispersal of side discharge rotary mowers. * Some believe clippings enhance turf disease. * Concern over clippings being tracked into a home or swimming pool. * The notion that clippings will accumulate and form a detrimental thatch layer. The idea that grass clippings form a major part of thatch has been refuted in the literature. Thatch forms when turf roots, stems [crowns, rhizomes, and stolons], and leaves are sloughed faster than they can decompose. The negative aspects of thatch layers in excess of 1/2 inch are: 1] increased potential for cold, heat or drought-related injury, 2] more problems with insect pests and fungal diseases, and 3] additional irrigation required by the turf. Thatch can be more of a problem in grass species that spread by stolons and rhizomes such as bermudagrass, zoysiagrass, St. Augustinegrass, Kentucky bluegrass, and creeping bentgrass. It is not a great concern with bunch-type grasses such as tall fescue and perennial ryegrass. It is worsened by management practices that fuel vigorous growth [high rates of fertilization and frequent excessive watering] or inhibit microbial decomposition [e.g. poor soil aeration and low soil pH]. Repeated core cultivation or mechanical removal are means to control thatch development. The mulching type mower, a relatively new technological development, has made returning clippings to the turfgrass system easy as well as popular. Several organized programs have been created to convince homeowners that clipping removal is unnecessary. The Don't Bag It program and the Grasscycling: Today's Turf, Tomorrow's Earth program, sponsored by the Professional Lawn Care Association of America, are two examples. The Texas Don't Bag It campaign is based on research in which mulching mowers were provided to 184 homeowners who had previously bagged clippings. After returning clippings for one season with the mulching mowers, the participants rated their lawns 30% better than the year before. Even if clippings are collected, several recyclingoptions for this rich source of organic material are available. For instance, applying freshly collected grass clippings to turfgrass sites where clipping removal is not a priority may be a logical option. This is already done on some golf courses, where clippings are removed from putting greens, tees, and fairways, loaded into modified manure-type spreaders, and disposed of by broadcast application onto the roughs. For homelawns, clippings could be removed from priority areas and spread onto lower visibility areas or even gardens. 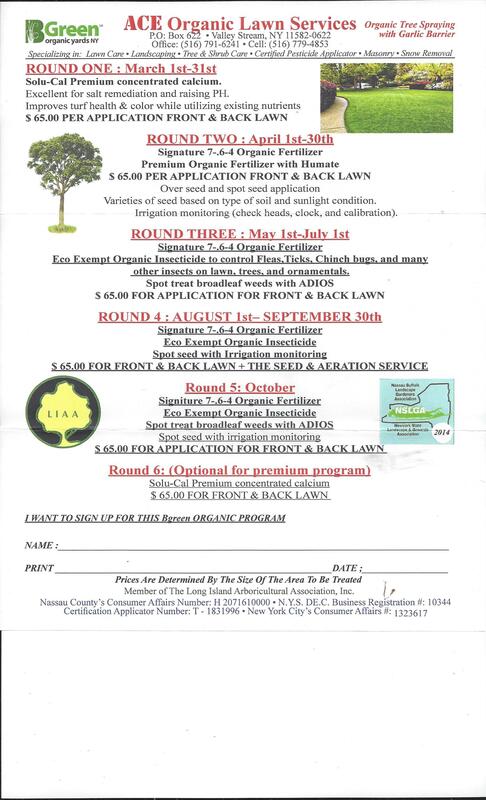 In these cases, excess fresh grass clippings may be treated as a type of organic fertilizer or soil conditioner, previously referred to as FGC. If clippings must be removed and an on-site disposal mechanism for fresh grass clippings is not feasible, on-site compost techniques are recommended. Compost techniques are now available that can turn fresh cuttings into rich organic matter. The resulting compost can be used to improve lawn and garden soil conditions. When fresh grass clippings are returned to the turfgrass system, certain management practices must be employed to insure success. Mowing techniques and plant nutrition are integral parts of this specialized management scheme. If grass clippings are left in place, they must be cut small enough to filter through the turfgrass canopy and down into the soil region. Once this occurs, the clippings can decompose and become part of the continuing turf-soil nutrient cycle. Thus, the success of an on-site grasscycling system directly depends on mowing techniques. A specialized mulching type mowe helpful, but it is not required. A traditional side-discharge mower can also work. The following mowing practices will enhance your lawn's appearance and hardiness. Mow when the grass needs it! A guide is to mow often enough so that at any one mowing only one third of the leaf height is removed. This will probably be every five to six days during the active growing season, and every 10 days or less when growth slows down. Keep mower blades sharp. Dull blades rip and tear the turfgrass which promotes disease, causes the shredded leaves to appear tan and ragged, and results in weakened plants. Mow when the grass is dry. Wet grass clings to the mower and clumps on the turf. Wet clippings also do not filter through the turf canopy to add nitrogen [N] as easily as dry clippings. Commercial fertilizers are the prevalent source of nitrogen [N], phosphorus [P], and potassium [K] used on home lawns. These include fertilizers such as 10-10-10, 5-5-10, etc. Traditionally, 1 to 4 pounds of actual nitrogen per 1000 square feet of turf area have been applied to cool season turfgrasses every year, even when clippings are returned during mowing. Slow-release fertilizers, applied in the late summer/fall to cool season turfgrass, or applied in the spring/summer to warm season grass, are less likely to result in N leaching than are readily-available N sources. Slowly-available sources include urea formaldehyde [UF], UF based products [methylene ureas], sulfur coated urea [SCU], isobutyldine diurea [IBDU], and natural organics which include bone meal, fish meal, dried blood, animal manures, composted sewage sludge, and FGC [fresh grass clippings]. If the grasscycling technique is being used on turf, the lawn will still require a yearly application of fertilizer to look its best. On an average, dried clippings only contain 2 - 5 % N. However, this amount of N is slowly released and will not produce an immediate greening-up effect. Even though an immediate visual response is not produced from recycling clippings, the long term effect from continuous additions of organic matter [clippings] should help improve the soil water holding capacity and fertility. For the homeowner, this translates to less time and money expenditures for fertilizer and water. Making a grass-compost is more labor-intensive than grasscycling and fertilizing with FGC. A carbon-rich source such as tree leaves, sawdust, or ground wood chips must be blended with the fresh grass clippings to produce compost or the decomposing turfgrass will emit foul odors. The optimum ratio of turfgrass to carbon-rich source for efficient composting is determined by the carbon to nitrogen [N] ratio of the compost feedstock. In general, a 1:2.5 to 3.0 ratio of clippings to leaves, sawdust, or wood chips [by volume] will be adequate to start the process. The system can be fine-tuned by adjusting the grass to carbon source ratio once composting has been initiated. Additional grass will accelerate the composting process if N is deficient for microbial activity. * A complete nutrient source - N, P, K and minor elements included. * Source of organic matter. * Little N loss to leaching. * Clippings are heavy and wet, difficult to transport. * Clippings are difficult to store, must use soon after harvest. * Clippings can be difficult to spread. 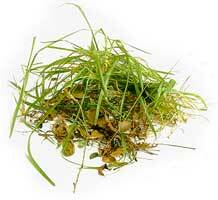 * A thick application of wet clippings can smother turf. As the compost microbes multiply and feed, heat is generated and the pile can reach temperatures above 160°F. If this occurs, the beneficial microbes will start to die; therefore, the pile should be turned prior to reaching 160°F in order to dissipate the heat. In the summer, the pile may need to be turned as often as every other day, while in the fall the pile may need turning once a week. 1. The compost pile or bins should be placed in a semi-shady location near a water source. Keep in mind neighbors who may object to a compost pile within their view. 2. Materials may either be mixed before placing them in the bin or layered. Layer materials by placing a 4- to 6-inch layer of high carbon materials [leaves, sawdust, wood chips] in the bin. On top of this place 2 inches of grass clippings [high nitrogen]. 3. Water each layer until the material is wet to the touch, but water cannot be squeezed out by hand. Continue layering until the bin is full. 4. The pile should obtain 110 to 139°F in just a few days. Add more clippings if the pile does not heat sufficiently. Turn the pile one week after the pile temperature reaches 110°F and every two weeks afterwards. However, it is best to monitor the pile's temperature during the summer to ensure that the temperature does not exceed 160°F. Yardwaste compost is beginning to replace peat as a soil amendment due to the increasing cost of peat. Compost can improve the water holding capacity of porous sandy soils and improve aeration and drainage on clayey soils. The suitability of compost as a soil amendment depends on the maturity or stability of the compost, nutrient availability, pH, water-holding capacity, and particle size. Stability can be determined by having the compost tested by a reputable agricultural soil testing laboratory for physical, chemical, and biological properties such as pH, water holding capacity, total kejdahl N, P, K, and heavy metals. Compost should also be mature when used. Maturity is an expression of the degree of stability of composting materials. A mature compost is dark-colored with an earthy scent. Immature or unstable compost may produce toxic compounds which harm plants after being added to soil. Only use thoroughly composted materials from known sources! The best use of compost for the homeowner is as a soil amendment. To increase the organic matter content of soils for lawn or garden establishment, an application of 1/2 to 1 cubic yard of compost [or about a 2-inch depth of compost covering] should be incorporated into 1000 square feet of soil. Compost can be added to established lawns and gardens if applied in the spring and fall. A 1/4-1/2 inch application of compost is an adequate topdress for lawns, but a deeper topdress for a garden can be used. The nutritional value of the grass compost depends on the proportions of grass to carbon source. For example, compost having a higher proportion of turfgrass clippings than tree leaves will provide more plant-available N and P.
Like many perceived 'waste' products, grass clippings have an intrinsic value that merely needs to be recognized and properly used. The techniques presented here for recycling grass clippings involve minimal investments of money, time, and energy, and produce healthier lawn turfgrass than the sole use of inorganic fertilizers would allow. Once a pattern of clippings reuse is established over several years, the lawn turfgrass system will become more self-sustaining and likely will require less investment in fertilizers and water than was required prior to recycling.